When we attended the knitting for the needy thingy a lady was knitting a beautiful, fluffy, pink scarf that will be given to a little girl in need. My daughter loved that scarf and asked if I could make her one. I have been busy knitting at every opportunity trying to get the scarf done before she turns 6 years old. 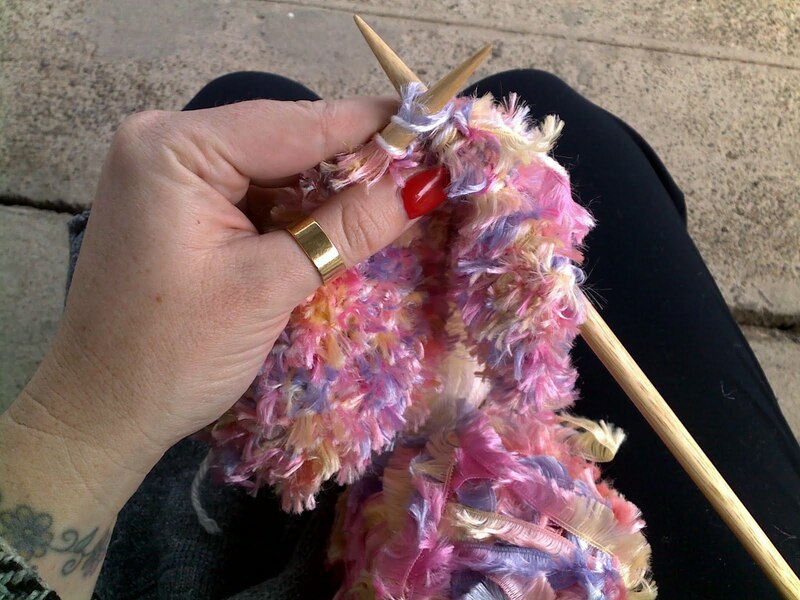 Here I am knitting while waiting for the train. I also am knitting during my 10 minute train ride. My daughter will be turning 6 tomorrow and I know that the scarf will not be ready cause tonight I have to bake 25 cup cakes. Tomorrow my daughter’s whole class will stop for morning tea, sing her happy birthday and eat the home made cup cakes with fairy sprinkles. Where did the last six years go? My baby is now this reading, spelling, mathamatic whiz that loves high heel shoes and pink dresses. She is definately my favourite daughter.